In a medium-sized container, combine the flour, baking powder, salt and cinnamon. Add the chia seeds, maple syrup, milk and vanilla, and mix until batter is uniform in consistency. Spoon into greased donut pan. Bake the donuts for 22-25 minutes, or until an inserted toothpick comes out clean. Remove from oven and let donuts rest for 10 minutes before removing from the pan, and arrange them on a plate or tray to finish cooling completely. Sprinkle the donuts with cinnamon and chia seeds to further intensify the cinnamon-chia flavor! Donuts are my weakness, and when I was a student I would stop to buy them often. Now that I’m a mom, my kids are the ones asking me to stop for fresh donuts. Last week I decided to make homemade donuts using delicious “power” ingredients in place of traditional ingredients. 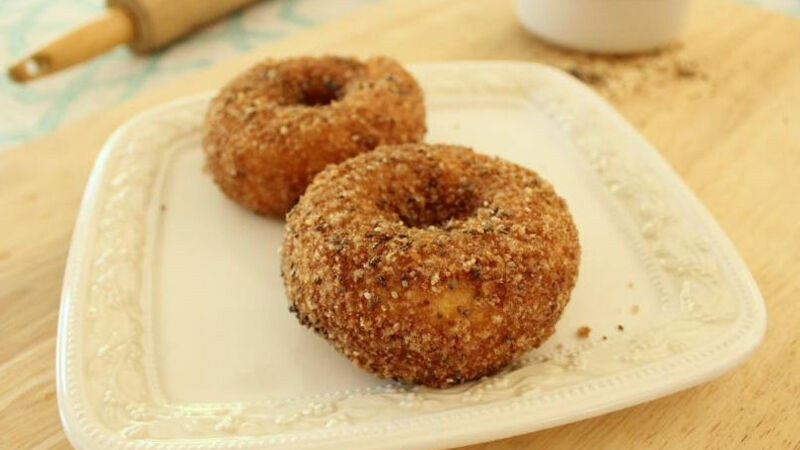 They turned out excellent; you have to try these chia seed, cinnamon and maple syrup donuts!